Huawei said it is the first company to complete a 5G SA (standalone) functional C-Band test based on 3GPP standard. The SA test of 5G radio access network (RAN) took place in the third-phase of China 5G technology R&D test in Beijing and organized by the IMT-2020 (5G) Promotion Group. The Huawei test marks the first 5G SA functional test based on the official protocol version of 5G NR (New Radio), following the 3GPP announcement of completion of the 5G NR Release15 standard (SA) in June 2018. Huawei provides test results on SA and NSA (non-standalone) for global operators, shows the strong ability in providing network deployment via validating products and solutions, and then promotes everyone’s determination to commercialize 5G scale networks currently. Huawei’s End-to-End (E2E) commercial products based on 3GPP standard NR SA protocol, including 5G NextGen Core (NG Core), gNB , 5G commercial terminal sample with Balong 5000 chipset, are adopted in these test procedures. The Option 2 for SA, which is the most operators’ first choice for network architecture, makes easier for direct connection between 5G gNB and NG-Core, and then assembles independent E2E 5G network without eNodeB. Based on 3GPP NR protocol, the sufficient validation are conducted for 5G key technologies and scenarios, including basic functions of the physical layer, physical channels, link adaptation and scheduling, multi-antenna technology, basic functions of the upper-layer protocol, uplink and downlink decoupling, etc. It provides the reference of network performance for pilot tests which are doing or to do in early implementation of 5G deployment by some leading operators. The test results mainly satisfy the key requirements from operators. 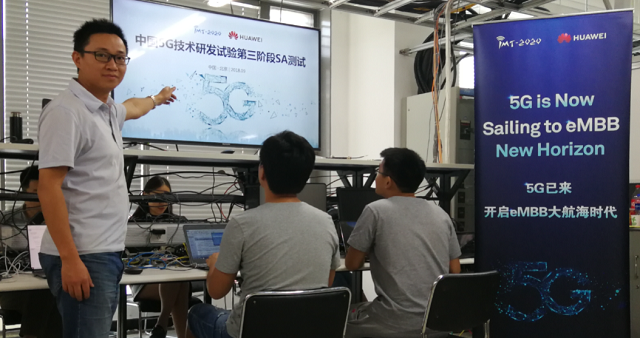 As an important part of the third phase of China’s 5G technology R&D test, Huawei’s ultimate test results for NSA and current test results of SA are of great value to the leading operators’ blueprint for 5G commercial deployment. China’s 5G technology R&D tests have been underway since 2016 and are expected to continue through the end of 2018. Three phases of tests are planned: 5G key technology trials, 5G technology solution verification, and 5G system network verification. The third-phase of China’s 5G technology R&D test was officially launched in February 2018 in Beijing’s Huairou 5G field. In this June, Huawei took lead in completing NSA function test and field test. Currently, SA functional test has been completed. Huawei will conduct SA field test in the rest of this year.